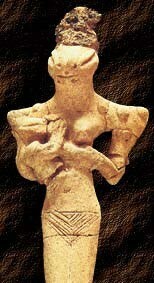 In Sumeria, whose civilization dates back to 3500 BCE, Nammu was the Goddess of the Waters of Creation. She was the great abyss, the endless primeval sea in which the Universe floated, that which She brought forth. She was also called the “Mother of Everything” and “Mother, First One who Gave Birth to the Gods of the Universe”. According to the An-Anum, the list of Mesopotamian deities, She is called “The Mother Who Gave Birth to the Heavens and the Earth. Creation came from the Great Goddess, from those Waters of Creation; and so, Nammu is as old as time itself, as She was always there and always will be there. She has no beginning and She has no end; all life is owed to Her. She is the Creation of all things. Her name was/is written with the sign for “engur”, which is also used to write “Apsu”, the sweet fertile waters. 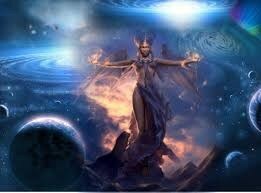 She gave birth to An/Heaven, a Sky God and to Ki/Earth, an Earth Goddess. An and Ki produced air between them. 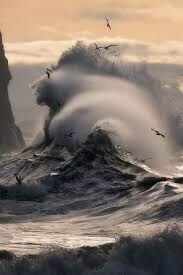 This air stirred the waters surrounding the large mountains between them and so was separated the Earth and the Sky. She also birthed the first gods, who represented the ocean water, far down beneath the Earth, which was the source of the life-giving water and fertility of its’ people. It is said that She also helped Mani, an All-Mother herself, form humanity. Mani was a potter who mixed clay over the cosmic abyss to form 14 images of herself. She put them in two rows, seven on Her left and seven on Her right, and with life-giving incantations, humankind was born. An and Ki gave birth to the Trickster god, Enki, God of Water and Wisdom. In early traditions, it is said that She is also grandmother to Inanna, a daughter of An and Ki. With the onset of sky gods, and the very beginnings of patriarchy, Nammu was demoted and Her power stripped away like so many other Goddesses. Most of Her power and credit for Her Creations were then given to Enki. Nammu corresponds to the Babylonian Tiamat, who also lost Her power and position to Marduk, a sky god, when Babylon took over Sumeria. Allegedly, Marduk created the heavens and earth by murdering Tiamat. Eclectic-Fest in Taunton, Mass. April 27, 2019 at 11:00 am – 6:00 pm Taunton VFW, 82 Ingell Street, Taunton, MA 02780 Hosted by Enchanted Forest. Visit http://MysticalShores.com! Eclectic-Fest MA 2019! April 27, 2019 at 11:00 am – 5:00 pm Veterans of Foreign Wars, 82 Ingell St, Taunton, MA 02780, USA 4th Annual Vendor & Psychic Fair! Visit http://MysticalShores.com!